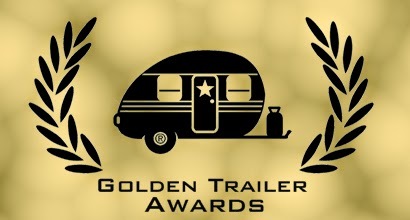 When I learned I'd been double nominated for Hollywood's Golden Trailer Awards I think I was so excited I swore! then I posted repeatedly about it all over various social media outlets, much to the annoyance of many of my online "friends"
So why shouldn't you capitalise on your high points? In actual fact they auditioned and re-auditioned me so many times that at first I thought it was a practical joke, it turns out they're just perfectionists, I love perfectionists, I'm a bit of a perfectionist myself, but perfectionists can wear you down with their constant "do it agains"and their unceasing "say it this ways" and "try it that ways" bless 'em! But then the trailer comes out, you see the perfection in it, you understand why the auditions and recording sessions were so long and why so many re-runs and pick ups were needed, even though you suspect the takes they finally used were the first ones you ever recorded, the trailer is perfect! The icing on the cake is when you later learn that this awesome work you all achieved together has been nominated for prestige industry accolades! The great thing about my trailer voiceover in the Mortdecai promos though, is that it's not your typical archetypal North American movie trailer voice, it's in fact a character voice, based on a quintessentially British "Jeeves the butler" type character, to draw another Charlie Chaplin parallel, its a rare treat for a "Limey" to be making waves in Hollywoodland! I worked long and hard in partnership with the wonderful folks at Tiny Hero on this, they truly are perfectionists and I'm glad we've achieved a movie trailer masterpiece that breaks the mould and the cliches of the genre, winning the DLF award for a non-DLF style movie trailer voice-over would be a real coup, but one of the nominees is a female and we've all seen the film "In A World" haven't we!